A stay at Grand Texan Hotel & Convention Center places you in the heart of Midland, a 3-minute drive from I-20 Wildlife Preserve and Jenna Welch Nature Study Center and 6 minutes from Museum of the Southwest. This family-friendly hotel is 2.6 mi (4.2 km) from Haley Memorial Library and History Center and 2.8 mi (4.5 km) from Grande Comunications Stadium. 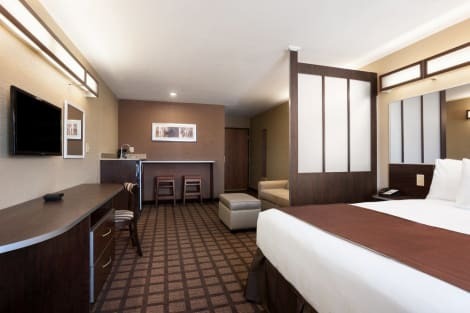 A stay at Wyndham Garden Midland places you in the heart of Midland, within a 5-minute drive of Museum of the Southwest and Haley Memorial Library and History Center. This hotel is 1.5 mi (2.4 km) from I-20 Wildlife Preserve and Jenna Welch Nature Study Center and 1.6 mi (2.6 km) from George W. Bush Childhood Home. Take advantage of recreation opportunities including a spa tub and a fitness center. Additional amenities at this hotel include complimentary wireless Internet access, a television in a common area, and a vending machine. Located in Midland, Suburban Extended Stay Hotel is a 4-minute drive from I-20 Wildlife Preserve and Jenna Welch Nature Study Center and 6 minutes from The Horseshoe Midland County Multipurpose Facility. 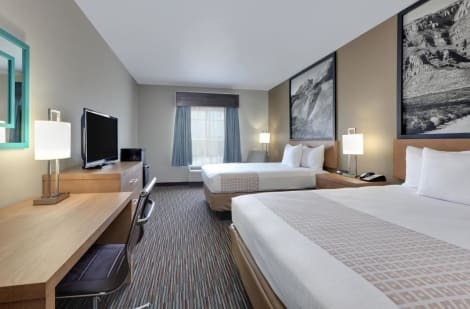 This hotel is 3.4 mi (5.4 km) from Grande Comunications Stadium and 3.5 mi (5.7 km) from First American Bank Ballpark. Mingle with other guests at the complimentary reception, held on select days. A complimentary full breakfast is served daily from 6 AM to 9 AM. Located in Midland, La Quinta Inn & Suites Midland North is within a 5-minute drive of Midland Park Mall and First American Bank Ballpark. This hotel is 2 mi (3.2 km) from Scharbauer Sports Complex and 2.4 mi (3.9 km) from Grande Comunications Stadium. lastminute.com has a fantastic range of hotels in Midland, with everything from cheap hotels to luxurious five star accommodation available. We like to live up to our last minute name so remember you can book any one of our excellent Midland hotels up until midnight and stay the same night.